Jim Kelly, Former NFL Quarterback. Leadership Speaker. Founder of the Hunter’s Hope Foundation. Jim Kelly was born and raised in East Brady, PA in a household that emphasized the importance of hard work and treating others with respect. He grew up in a large family and is one of six brothers. Despite his father being an orphan, Jim led a normal childhood, but his motivation was anything but ordinary. He signed with the Miami Hurricanes as a 4th string QB however through dedication and hard work, quickly persevered to starting QB; his dreams were in the beginning stages of spiraling into reality until that fateful day he injured his shoulder. Jim was told his career would be over, but Jim didn’t agree. In 1983 The Buffalo Bills selected quarterback Jim Kelly in the first round of the NFL Draft. Not exactly thrilled about playing in Buffalo, the Miami Hurricane star opted to sign with the Houston Gamblers of the United States Football League. He was named USFL Player of the year IN 1984. The USFL folded following the 1985 season, and Jim Kelly, just prior to the start of the 1986 NFL season, signed with the Bills. The Buffalo fans were excited for a new chapter. A strong-armed passer with a “linebacker’s mentality,” Jim Kelly lived up to his advance billing, as he virtually rewrote the Buffalo Bills’ record book for quarterbacks. Only three players in NFL history had reached the 30,000-yard career passing mark faster. Eight times during his NFL career, Jim Kelly passed for more than 3,000 yards in a season, and twenty-six times he passed for more than 300 yards in a game. Nicknamed “Machine-Gun Kelly”, Jim was perhaps best known for running the Bills’ “No-Huddle Offense”, which was fast-paced and denied opposing defenses the opportunity to make timely substitutions, establishing the Buffalo Bills as one of the NFL’s most successful and dangerous offenses. In 11 seasons, Jim Kelly led the Buffalo Bills to the playoffs eight times. At the time of his retirement, his 84.4 passer rating ranked sixth all-time and was second when compared to Hall of Fame quarterbacks. Jim Kelly’s 35,467 career passing yards ranked tenth in NFL history; his 2,874 completions ranked eighth; and his 237 touchdowns ranked thirteenth. In 2002, Jim was inducted into the Pro Football Hall of Fame in Canton, Ohio. His speech is said to be one of the best ever heard and his wish came true of having his son present to share in his special moment. Jim Kelly has devoted much of his post-football life to his son, Hunter, who was diagnosed with Krabbe disease (Globoid-cell Leukodystrophy) and passed away on August 5, 2005 at the age of eight. Jim Kelly established an organization called Hunter’s Hope, to raise funds to fight the disease. His advocacy on behalf of Krabbe patients has vastly increased national awareness of the disease. 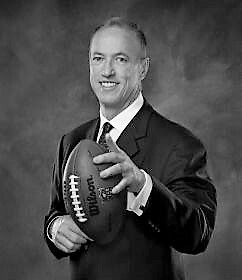 Jim Kelly is the CEO of Jim Kelly, Inc., he also runs an annual football camp for kids, is founder of the Kelly For Kids Foundation and Co-Founder of the Hunter’s Hope Foundation.